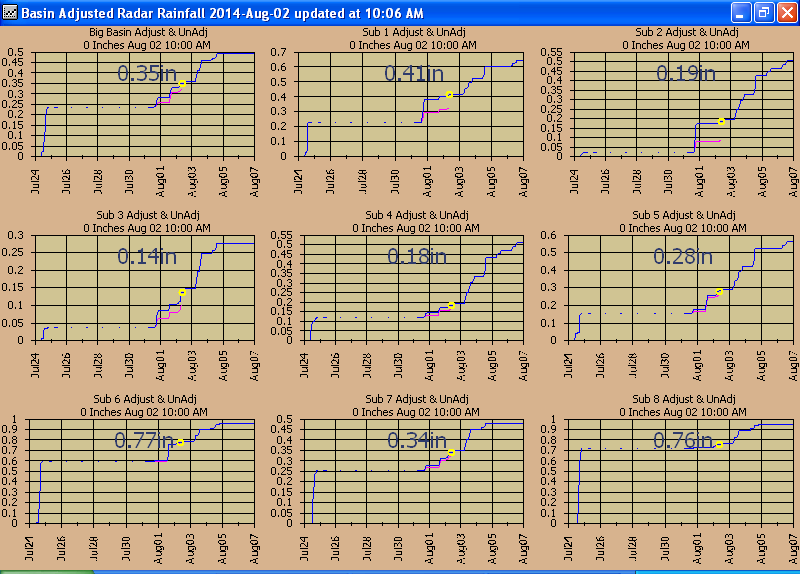 This web page demo is being used to refine the GetRealtime programs to automate dispaly of real-time runoff and forecasts for dissemination techniques over the web. It is also a collaboration with an Alabama egineering compay with a long time interest in runoff modeling for this particular large basin to see if radar can improve runoff and if dimensionless graphs can handle these big basins with out further complicating subdivisions. The 1,461 sqmi Tallapoosa River basin at Harris Dam was subdivided into 8 subbasins and is a much different type runoff than I normallly have studied in that each of these large subbasins have complex drainage systems and runoff timings. It was quickly found that the good ol' trusty SCS dimensionless unit graph and even the 3-Triangle unit graph was not even in the ballpark for dealing with the multiple timings of the stream confluences for these subs. 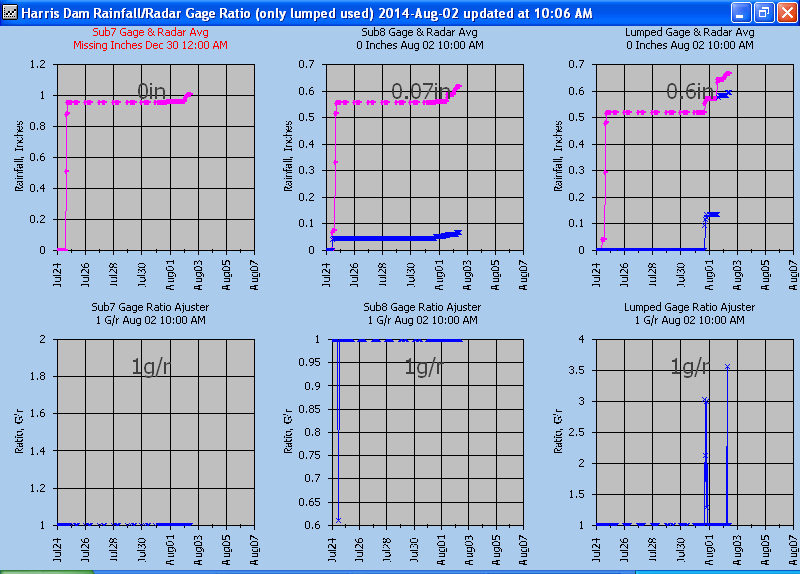 Not to fear, it was a simple matter to construct new dimensionless unit graphs for these large basins using the 272 sqmi Tallapoosa at Tallapoosa gage and 94.7 sqmi Little Tallapoosa at Carrollton gage. These 2 dimensionless graphs were then used at the other subs having similar hydrograph shapes. 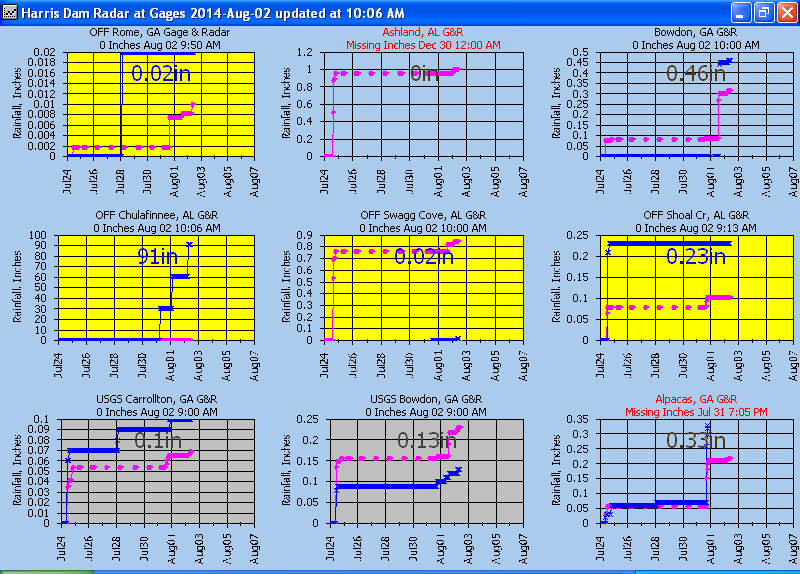 Note the strange shapes of the hydrographs below. There are currently 7 real-time Wunderground rain gages and 2 USGS rain gages that can be up to 1 hour in arrears (7+2=9 rain gages). 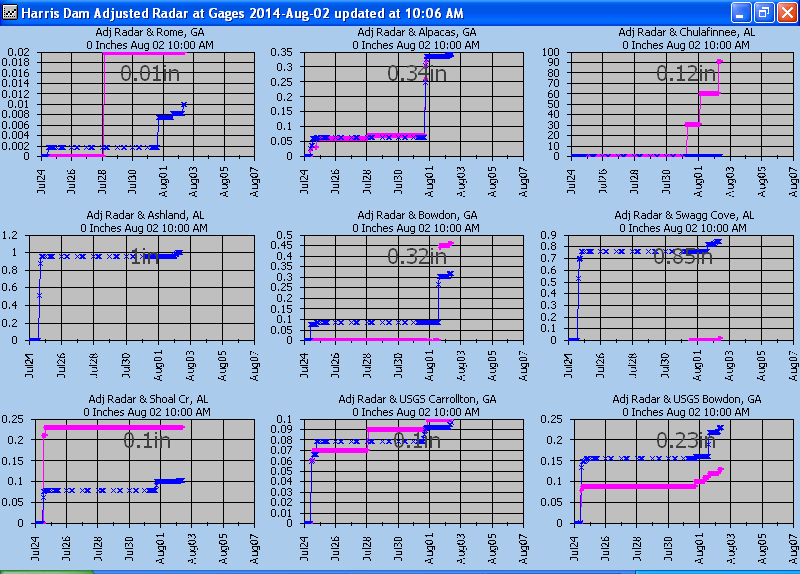 The USGS gages are excellant and the Wundergages as usual can be hit and miss. The current unused rain gages that are operator (that's me using the GetGraphs display) interactively turned off are displayed with a yellow background below. The 1-km 5-minute N0Q reflectivity was converted to rainfall at the gages, the Gavg/Ravg hourly ratio was applied to the subs averaged radar rainfall. 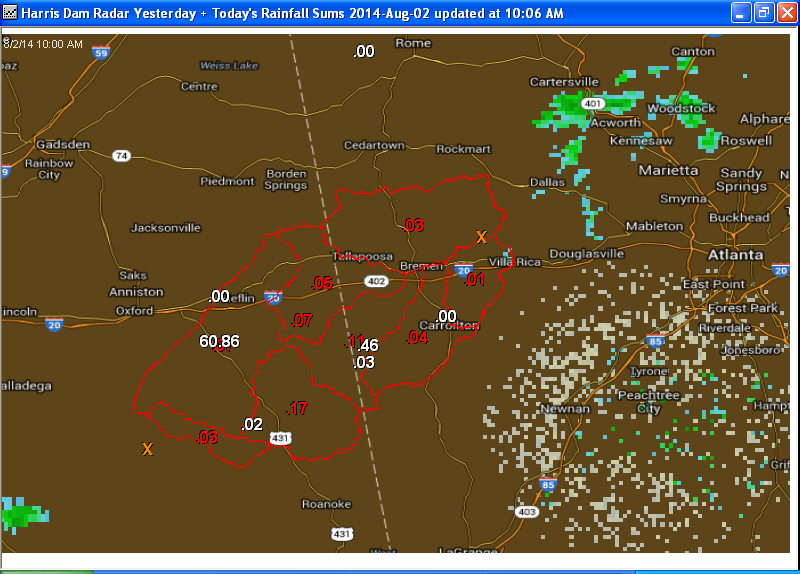 Typically the 2 or 3 nearest raingages are used to ratio each sub's radar rainfall. This study probably has as much a bad rain gage problem as the complications of using very large sub sizes... so the web automation is emphasized here but I'm not giving up on these large subs yet. And of course GetRealtime can replace the model routings at the USGS gages with the latest gaged flow for further routing but that is not what we need to tame these beasts. The following pics are updated automatically when ever GetRealtime runs. During periods of no rainfall, for this test GetRealtime creates the pics when I run it, probably daily. When it looks like rain I will start it at every 30 minutes or so to see how things work. Note all times are my Pacific Time. The folowing pics from Excel linked to the GetAccess database show how well or not so well our very large subs are doing runoff wise. 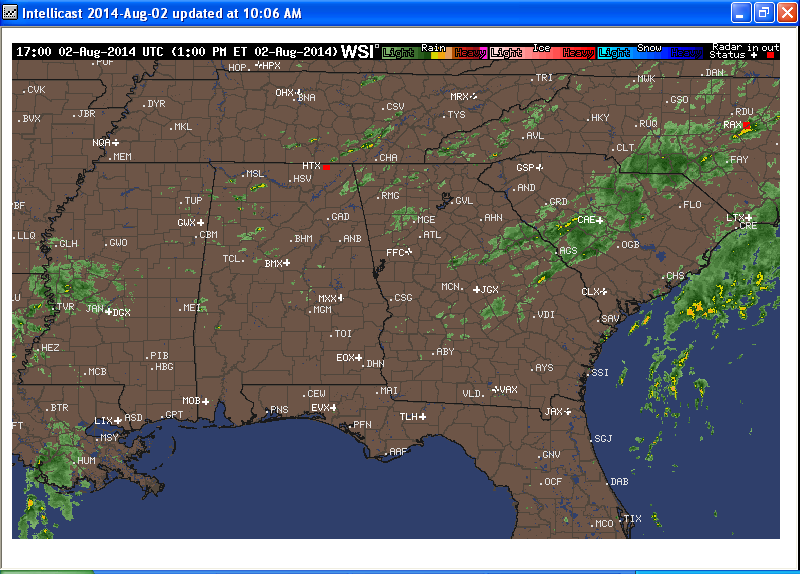 More or better rain gages couldn't hurt here. I will let these soils get acclimated before further runoff refining. There are 5 USGS stream gages in this basin to work with so this aint over yet. The runoff seems to be improving as the soil moisture gets up to speed and recovery factors were increased from 0.05 (sandy clay) to 0.17 (silt loam) steepening the recessions beginning June 1, 2014. Looking at the subs runoff below, this basin's runoff modeling if done for real-time operations could use some user input from time to time to get things back on track. From what I have read of Army COE's operator's runoff input at their larger basins, they would adjust the soil moisture to produce the observed runoff. 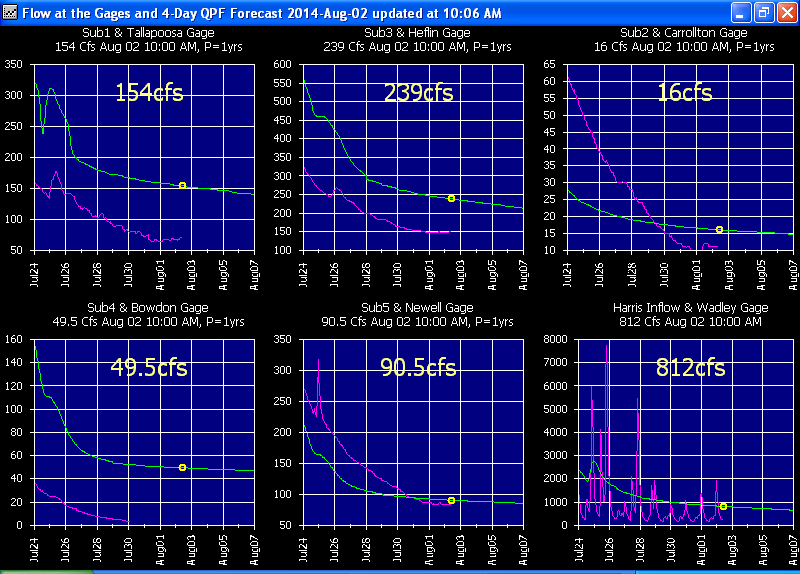 I believe the NWS does soil moisture adjust too. I'm thinking that rainfall being the weakest link here, you could adjust the recent rainfall to produce the observed peaking (or base flow?) and that would automatically get both soil moisture and groundwater flow back in shape. Something to think about and perhaps try in the future here. The flow point of real interest here is inflow to Harris Dam reservoir for release scheduling so event inflow volume is very important. 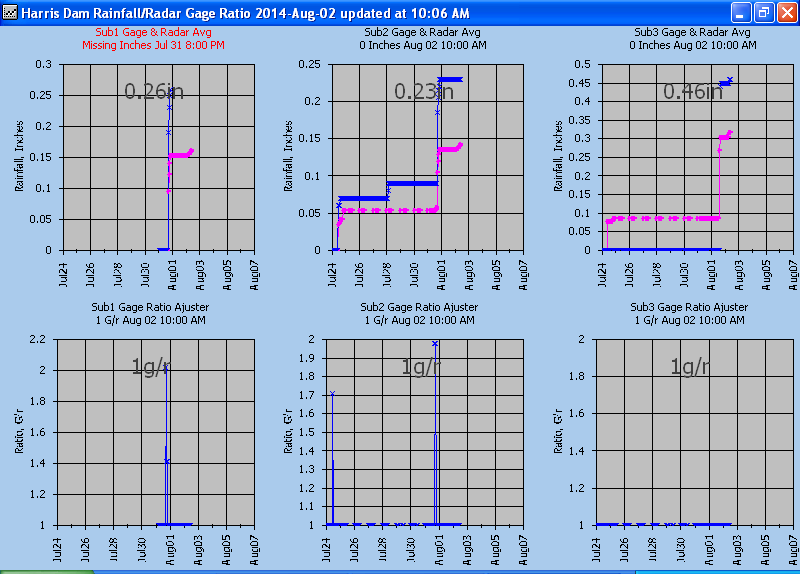 The USGS Bowdon gage seems to have been put on a fewer measurements schedule for thrift and the measurement 2014-05-16 seems way out of line with history and I have ignored it here. 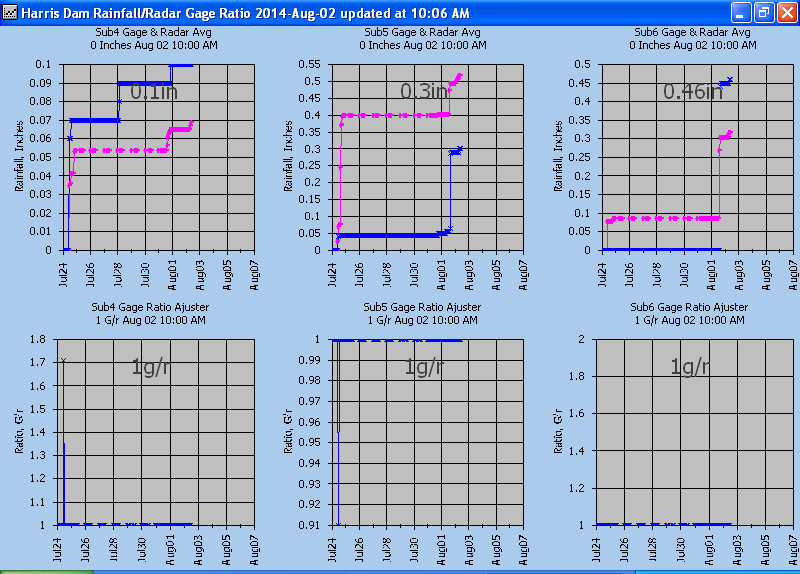 The downstream gage Newell seems to confirm the bad shift at this Bowdon gage. Did I ever tell you about the time I worked for the USGS and all we had were adding machines... and beer was 99cents a 6-pack (Brown Derby). Hmmm.... the CN above has broken to the downside of 70 in July. 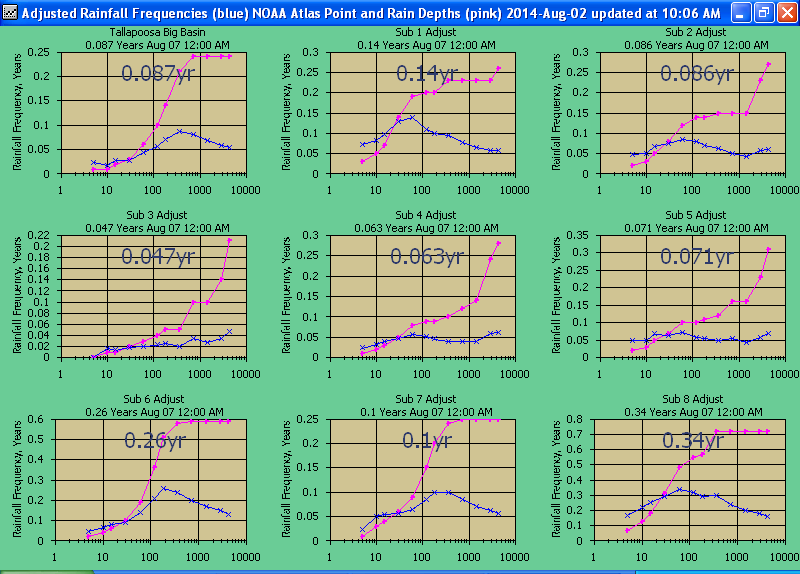 If we need to increase runoff we could raise the CNdry to 65 or even 70 with out much effect on earlier peaks. Note how I started at CN 71 to get the first peaks and is starting to get rethunk on CNdry. I'm no expert yet either. My current CN range of 60-90 is from what I have read about and have incorporated into GetRealtime's auto settings given a normal CN. And remember, the weakest link in all this is rainfall and is probably the real problem as I have seen time and time again so this may take months to play out.